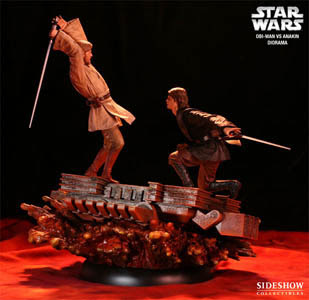 The Obi-Wan vs. Anakin Diorama from Sideshow Collectibles is approximately 1:9 scale [13 inches tall, 14 inches front to back and side to side]. The diorama is cast in high quality polystone, hand finished and hand painted. It depicts the final lightsaber duel between Obi-Wan and Anakin. » Click on "Sideshow Collectibles" in the sidebar for more info. Use the following link if you have a problem with the video above. 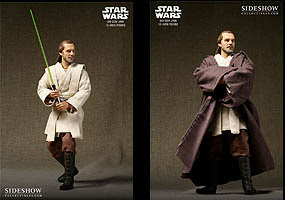 EU Collectors only ... A second chance to grab the Qui-Gon Jinn 12 inch Star Wars figure from Sideshow Collectibles at a 20% discount. **Please note that this figure's quantity is very limited, so if you have an interest, grab one now! This figure is sold out for US collectors.